But yeah, the CJ’s will spoil ya. I hate the rain crack, but they’re pretty care free. It’s funny, I was into an email convo with Bernis at HBUSA and I mentioned that I was concerned about the lack of interior fruiting on my CJ’s this year, and that they just seemed a little sparse, etc. When she replied to the overall email she included a quote from Dr Bors regarding renewal pruning. I wrote back saying that was funny as that was a quote he had written to me in an email back in 2014. She said LOL she got it off the fruit forum and now has it on her website. I did get to taste Juliet and I like it a whole lot! A lot sweeter and a lot bigger than CJ. A lot bigger! I’ll get a brix on them tomorrow too. Thanks @IowaJer looking forward to trying a better cherry for sure! CJ have a place in my orchard for a while for sure but who knows we may someday graft them all over to Juliet if they are that good. but my CJ’s were their usual below normal brix. I don’t get this? In upper Canada their getting high brix. Mine were great, I didn’t take the brix of mine. I will next year. If it isn’t working it isn’t working. I have Juliet too, no fruit this year, but it is a little thing. I would prefer a bigger cherry, as long as they taste as good as CJ. Montmorency to me is not as good, I much prefer CJ, so put up with the small size. Could it be that my plant had so little fruit and all the energy from the leaves went into them or else my refractometer is out of whack? Save me a slice please!!! Going by that photo, I would say they will be ripe in 3 weeks. I let them hang forever, I really like when fruit is fully ripe. I have not harvested my honeyberries yet and they have been blue for three weeks. 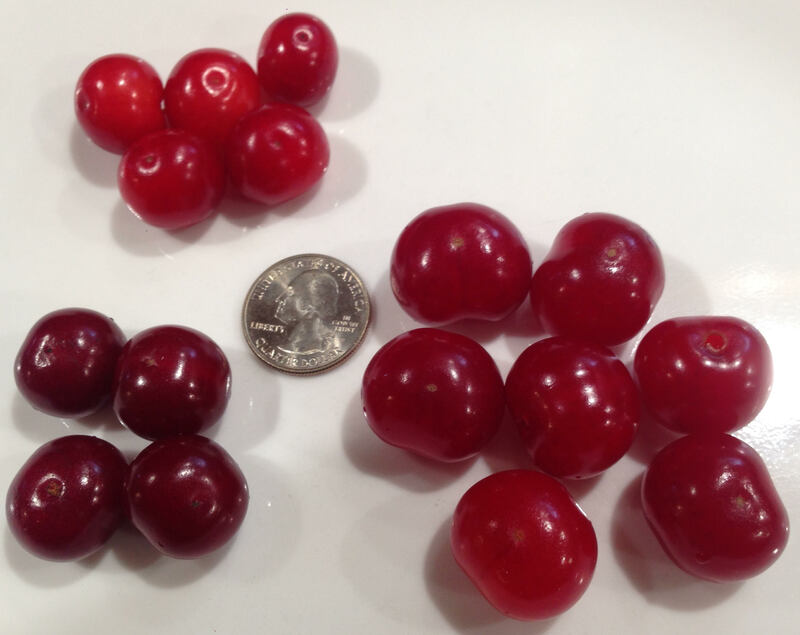 My White Gold cherries are blushing red, I won’t even try one for at least another week. Still getting 11 brix reading this morning. I’m going to see about recalibrating once I get some distilled water. Here’s a comparison of CJ, ER, & Juliet. How many juliet did you get? Are they SUPER? compare/contrast to CJ? Japanese beetles are showing up today in huge numbers finishing off the last carmine jewell cherries they can find we left behind. Glad they were not earlier! I have two bushes that were planted in 16. They’re both nice bushes that are 7-8’ by now and maybe 4-5’ wide. One bush had more blossoms and then tiny fruit than the other, and both aborted a lot of the cherries that were there to start with, which didn’t totally shock me. 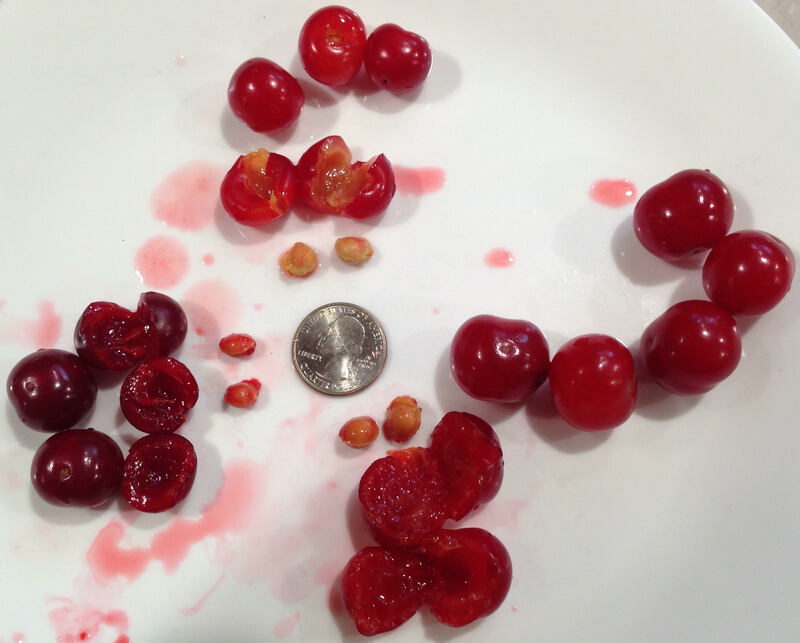 In the end I’m guessing we’ll see maybe 40-50 cherries total? They hide in there of course, and I’m only now starting to see them ripen. There are more unripe than ripe, so it looks like I should be able to count on them needing picked close to when the CJ harvest is nearly done. Of course we won’t have enough for cooking anything with this year, only some out of hand comparisons. So far in my opinion it’s not even a contest, I like the Juliet out of hand considerably more. My wife and a gal who’d came over to buy some CJ’s both ooed and awed after popping one in their mouths. The size difference is appealing to me - one in your mouth takes up a lot of room! I particularly like the tint of pink in the juice. I can’t wait until I have enough for a pie or jam. I just can’t envision them ever being able to compete with CJ on the production front though. A family came by and picked another 5 gallons yesterday so we’ve now taken 54 gallons off the 5 bushes for an average per bush harvest of 48.6 pounds based on 4.5# per gallon. And there’s more out there… The U of S CJ bushes are flat out cherry machines! thats great to hear. got 2 juliets and a CJ i put in this year and so far growing well… told my older neighbor about them and where i bought them from and he just put in 1 of each. he has a geener thumb than i do and better soil so it will be interesting seeing how they compare as they grow over the years. For me, it’s bad enough that they fooled me into thinking that they were going to be world beaters similar to the CJ’s just by their shear growth in a couple years. But that was about the only thing to get jazzed about with these two. They’ve been in ground since '14 and just can’t find it in themselves to make a single cherry. But they do each have some kind of issue which I kinda think is vascular but don’t know for sure of course. But throughout the bushes there’ll be branches that sort of take on a downward growth habit, and are weak at the union often with a touch of gummosis there. Then it’ll all but fall off and you’ll notice it from a distance by the dead leaves. When I first started noticing it I thought it was some animal had climbed up and damaged the branch but no such luck. Add to that they are the only two bushes that seem to be cherry-leaf-spot magnets. All the bushes get the same fungicide sprays and yet these two…grrrrr!!! They should have never released CP, I’m worried about Juliet being lonely…Romeo Romeo where art thou? Im going to take my last CP out. I wonder if I can get my money back? Definitely was some false advertising there based upon everyones experience. Actually I have yet to hear of a positive experience with CP! 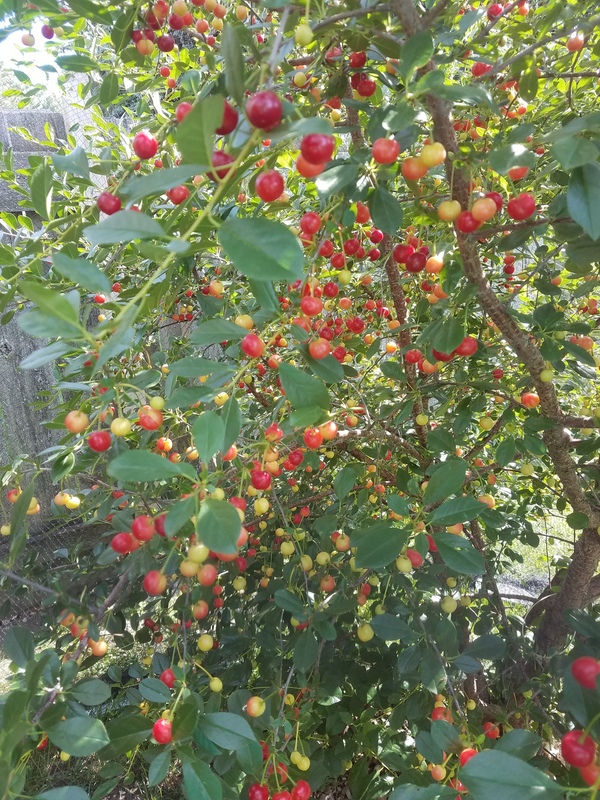 Ive got about 6 cherries on my romeo this year, I netted it but not sure if they will make it through till harvest. I was thinking of grafting Romeo on CJ. I sure appreciate all the shared experience here. After reading this thread, and seeing the pies, and bags of cherries I am super looking forward to planting out a row of cherry bushes. The site is still a bunch of cottonwood stumps down the fenceline, and the bushes are still growing in the nursery, but hopefully this year (or early next year in jan) we will be able to plant them out. We started with (if I remember right) about 30 each of Romeo and Juliet, and over that in Carmine Jewel. (Gophers got a few) The thought of even 20 lbs times 100 bushes is hard to imagine, but with @IowaJer reporting yields of over twice that I am thinking we are going to eventually need a serious plan for how to use or sell the potential harvest! I’m thinking a cherry hard cider made from red fleshed apples and cherry juice. …and pies, and canned cherries in fruit juice for the kids to eat with their peanut butter n bread…and dried cherries…and jam…and Yippy Skippy but this is starting to sound like work! At least my “jobs” can help dad in the garden (where they are now) and me in the kitchen with the canning. Growing food and a family is not everyone’s dream, but it is mine.